WASHINGTON — Working to display a united front, the United States and key Asian countries will seek Thursday to put more pressure on North Korea as world leaders open a nuclear security summit in Washington. 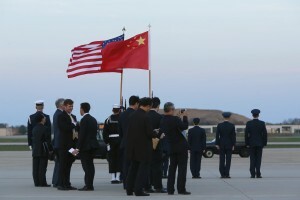 President Barack Obama, the summit’s host, will also seek to smooth over tensions with China over cybersecurity and maritime disputes as he and President Xi Jinping meet on the sidelines. The summit also offers Obama his last major chance to focus global attention on disparate nuclear security threats before his term ends early next year. Though nuclear terrorism and the Islamic State group top this year’s agenda, concerns about North Korea’s nuclear weapons program are also commanding focus as the two-day summit gets under way. Those long-simmering concerns have escalated of late following the North’s recent nuclear test and rocket launch. Obama planned to have a joint meeting Thursday morning with Japanese Prime Minister Shinzo Abe and South Korean President Park Geun-hye, two U.S. treaty allies deeply concerned about North Korea. It’s a reprise of a similar meeting the three countries held in 2014 during the last nuclear security summit in The Hague. China’s influence over the North will be front and center later in the day when Obama sits down with Xi. The White House said that meeting was also an opportunity for Obama to press U.S. concerns about human rights and China’s assertive territorial claims in waters far off its coast. Though frictions with China remain high, the U.S. was encouraged by China’s role in passing stringent new U.N. sanctions on North Korea, its traditional ally. Now the U.S. is pressing Beijing to implement those sanctions dutifully. The U.S. and South Korea have been discussing whether to deploy a U.S. missile defense system called THAAD, or the Terminal High-Altitude Area Defense, in South Korea to counter the threat from the North. China has resisted that step out of concern it would also give the U.S. radar coverage over Chinese territory, and Russia opposes it as well. In North Korea, meanwhile, the government has been churning out regular propaganda pieces condemning the U.S. and South Korea, while warning it could launch a pre-emptive strike against South Korea or even the U.S. mainland at any time. For years, pressing security crises in the Middle East have overshadowed Obama’s goal of expanding U.S. influence and engagement in Asia, with the North Korean threat another unwanted distraction. Though the U.S. and China have struck sweeping agreements on climate change, they’ve remained at odds on many economic issues. Obama has also been unable to get Congress to ratify the Asia-Pacific free trade deal his administration painstakingly negotiated. Obama also planned to meet Thursday with French President Francois Hollande, amid steep concerns about terrorism in Europe following Islamic State-linked attacks in Paris and Brussels. The summit continues on Friday with a special session focused on preventing IS and other extremists from obtaining nuclear materials and attacking urban areas. Some of the 2,000 metric tons of highly enriched uranium and separated plutonium being used in civilian or military programs worldwide could be turned into a nuclear bomb if stolen or diverted, the White House warned. Fewer than half of the countries participating in the summit have even agreed to secure sources of radiological material that could be used for a dirty bomb, though more countries are expected to announce commitments during the summit to tighten controls.